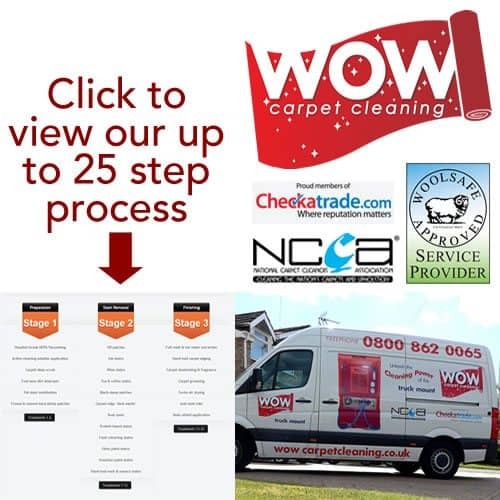 WOW Carpet Cleaning | Arguably the best carpet clean available! Don’t risk it with budget or cheap carpet cleaning! Yes you can choose DIY carpet cleaning, or you can employ a cheap carpet cleaner. You may get lucky with your stain, you may not! Using the wrong products on some stains can damage your carpet and lead to PERMANENT staining. 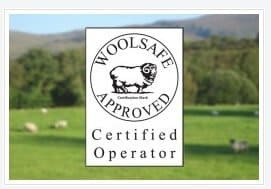 To gain this accreditation we are a company that meets the highest standards in professional cleaning having at least one WoolSafe Fibre Care Specialist technician, extensive professional training with many years experience and use only approved products when cleaning wool. The National Carpet Cleaners Association (NCCA) is the only UK trade association for carpet and upholstery cleaners. As an unregulated industry “anyone” can set themselves up as an “expert” when it comes to cleaning. Members of the NCCA have to adhere to certain minimum standards, which is your guarantee! As proud members of Checkatrade, where reputation matters, you can quickly see our wonderful reviews from real life, independently verified, carpet cleaning customers. This is your reassurance that you are dealing with an established and trusted carpet cleaning company! Your TRIPLE certified carpet technician will successfully remove even the worst carpet stains, without damaging your carpets or upholstery! We offer a professional carpet cleaning service to homes and businesses in Southampton, Winchester, Portsmouth, Chichester, Bognor Regis and surrounding areas of Hampshire and Sussex. Premium quality carpet cleaning products, certified ‘Child & Pet Safe. No harmful residues to cause headaches, illness or worse! Would Your Carpets Like a Clean? Contact us now for your FREE QUOTE or for more information. It's good to encourage child creativity, less great when it involves lipstick & your furniture! See the results of upholstery stain removal. 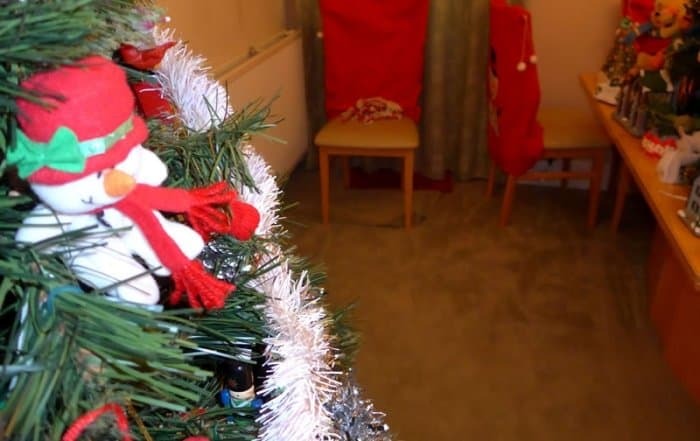 One of our last jobs in 2016 was this pre-christmas carpet cleaning job we undertook in Shirley, Southampton. If you want stain-free, radiantly clean carpets, then our upto 25 STEP carpet cleaning treatment will give you exactly that!. Beware of attempting save a few pounds now by using a budget carpet cleaner – they can make stains worse, destroy your carpets – or just not clean in the first place, leaving you to spend out more on a professional carpet cleaning company. Before having your carpets cleaned, you should the time to check out who you are considering letting into your home. It’s very easy for someone to buy a cheap carpet cleaning machine, charge the lowest going rate and start ‘carpet cleaning’. Unless a carpet cleaner has had professional training, there are many serious mistakes which they can make. Over-soaking carpets is common, which later causes mold to develop in your carpet. Using too much water pressure and tearing your carpet’s backing (which causes bald patches) is another common error. 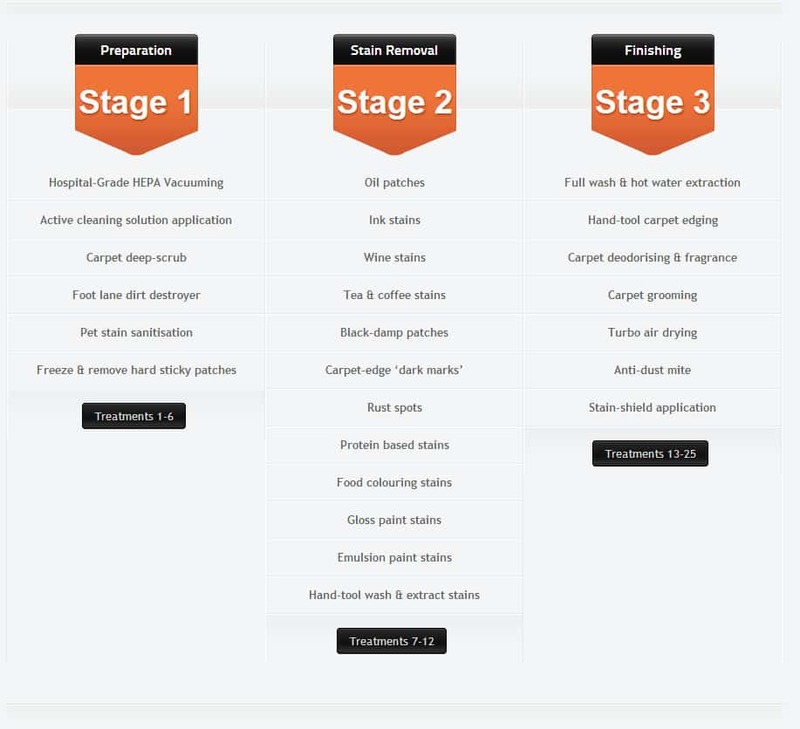 A professional carpet cleaner is someone who has undertaken proper training to become an accredited carpet technician. 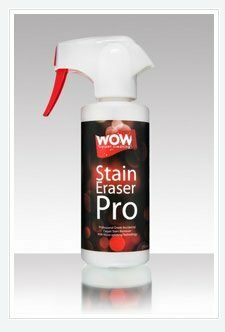 All Wow technicians have undergone the highest levels of industry training – we also supply them with state of the art cleaning machines and technology. Our truck mount cleaning system delivers the results your carpet and upholstery deserve! A good quality carpet is more than likely made from wool or from a wool-synthetic blend. 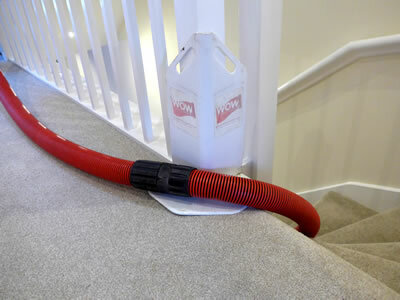 The two most common carpet cleaning ‘disasters’ involve wool carpets being shrunk or having their Colour changed. If you’ve ever accidentally shrunk a woollen jumper, then you’ll understand just how susceptible wool is to damage. Accidentally changing a carpet’s colour is very easily done in the wrong hands. Cleaning wool carpets by someone who is not explicitly qualified to clean wool carpets, it’s an accident waiting to happen. Wool is a natural fibre and there is one key principle which you simply have to adhere to. When cleaning wool carpets you have to make sure you test and restore the PH acidity level of the carpet when you are finished. 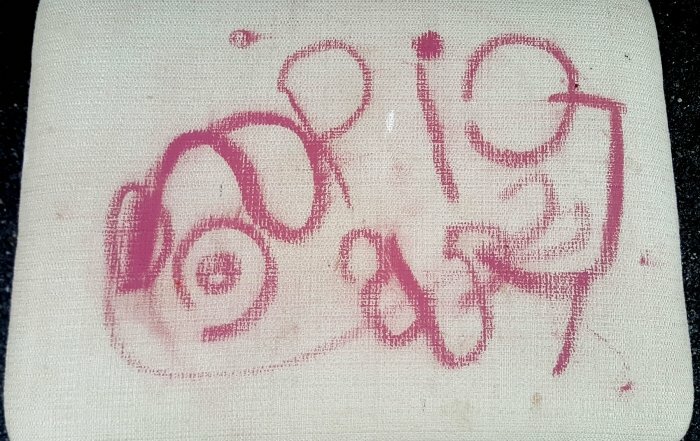 If you do not do that, carpets invariably turn pink. 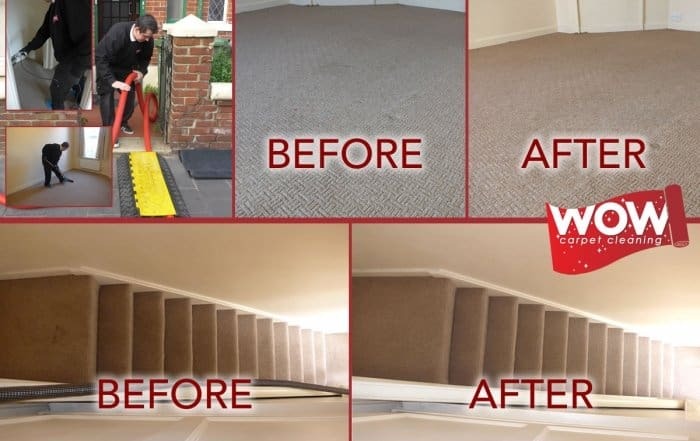 The only way that you can be sure your wool or wool-mix carpets are not damaged and are cleaned safely is if you use a Woolsafe approved carpet cleaner. Woolsafe is the international wool care and training body. No one knows more about the care and cleaning of wool than they do, and it’s only Woolsafe who provide specialist wool care training and official accreditation. To become a Woolsafe accredited carpet cleaner, you have to undergo extensive wool carpet cleaning training which is followed by a formal exam. 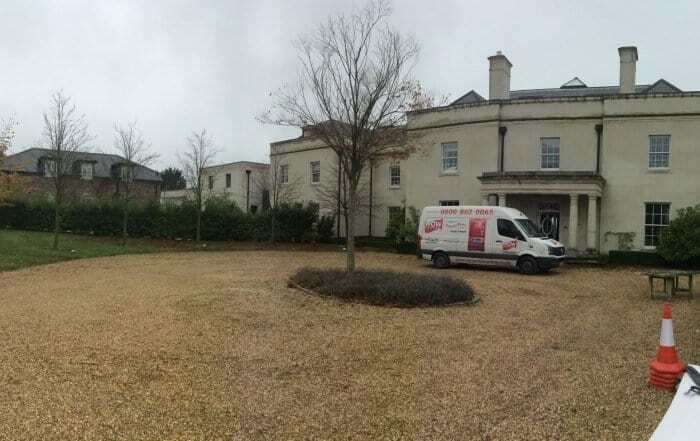 There is a very good reason why there are only a few Woolsafe approved carpet cleaners in Hampshire, and that is because of the commitment to the high level of training and education which a cleaner much pass in order to ultimately achieve qualification. A quick note regarding insurance… you would be forgiven for thinking that if ever there was an accident then ‘the insurance will cover it’. That is true, but only if the cleaner himself has adequate valid insurance. Cowboy carpet cleaners invariably are not insured (simply to save money in their eyes), but… if an uninsured cleaner works in your home and does not have insurance – you will have to pay to replace your carpets YOURSELF!. The reason for this is home & contents insurance policies commonly DO NOT cover any accidents caused by professionals whilst carrying out their work. A note here regarding ‘professional’, in the eyes of insurers, a professional is anyone who charges money for a service regardless of quality. Cheap carpet cleaning companies nearly always use cheap chemical products, it goes with the territory. The reason why the use of cheap chemicals is such a bad thing is quickly explained when you think of similar products such as cheap shampoo or cheap washing up liquid. They not only do an incredibly poor job at cleaning carpets to start with, but they also leave a sticky residue which attracts dirt like a magnet. Further still, they are also extremely prone to causing upset stomachs and discomfort for children and pets who come into contact with the nasty chemical residues which get left behind. The other thing which cheap chemical products do is leave a strong, headache-inducing chemical smell which lingers for a good day or two. The first step is for you to contact us to discuss any of your carpet or upholstery cleaning needs. Once we know what you need cleaning we will survey the job for you. From our survey we will produce a no obligations, cleaning quote for you. 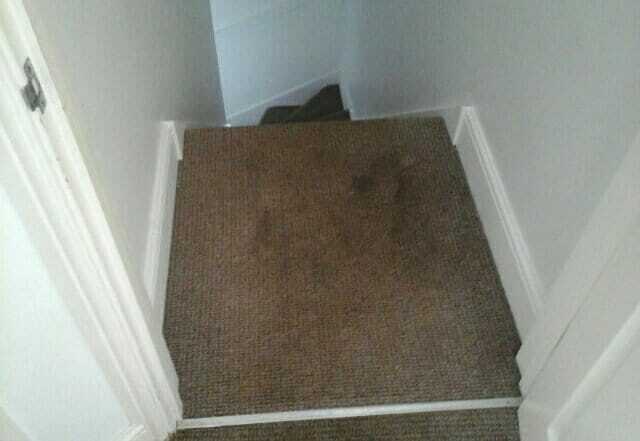 If you are happy with our quote then we can arrange a convenient time to clean your carpet or upholstery. Our professional cleaning operator(s) will attend on time and will WOW you with our clean! The below is a screenshot from our CheckaTrade review page as of September 2017. We always strive for the best and we feel these independent customer reviews speak for themselves! To achieve such consistently high rankings over hundreds of reviews shows to you we are doing exactly what we say we will.